Most Quails are detected when observers hear the distinctive and far-carrying whip-like song, ‘wet-my-lips’. This is usually the beginning of a frustrating attempt to find the bird, as they are expert ventriloquists and the call is extremely difficult to localise. When the bird is at very close range a gruff barking call can sometimes be heard, but even then it is difficult to pin it down. Birds tend to call mostly at dawn and dusk, sometimes during the night and occasionally during the day. Several of the Quail on this Atlas map were heard on only one occasion and not on return visits, so an element of luck is needed and the species is probably under-recorded. Males call only very occasionally when mated, and it is difficult to know if a calling bird has found a mate or moved on. All of the Atlas records were of singing males, apart from one north Wirral tetrad with a pair in 2006 (which had had a singing bird in 2005), and two adjacent tetrads in the south of the county, where one observer found chicks near Barmere and Bickley in 2004. They raise a large brood, typically eight or more chicks. Like all gamebirds, they eat mostly seeds on the ground, with invertebrates important for the chicks. They are mainly found in arable crops or long grass. 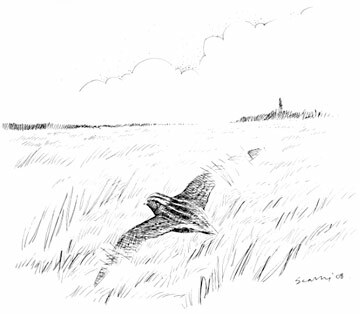 Two of the Atlas records were on the Dee saltmarsh and 13 of the 16 tetrads had birds in farmland, with 7 in habitat code E4, tilled land: in five of these seven, the observer noted the crop to be barley, quite a scarce plant in Cheshire and Wirral. Modern agriculture is inimical to Quail, and the species has declined greatly in Britain: it is on the Red List of species of conservation concern because of its historical drop in UK population during 1800-1995. Quail have an extraordinary sequential breeding strategy that has evolved to produce the maximum possible number of young. This is the only migratory bird of the ‘gamebird’ family; they winter around the Mediterranean or in trans-Saharan Africa, an almost unbelievable feat to anyone who has seen how weakly Quail appear to fly. Many of them nest early in spring in north Africa or southern Europe and then migrate further north to have a later breeding attempt. Remarkably, these migrants include young birds from those first broods, which are capable of migrating just two months after hatching and mature sexually at the age of 12-15 weeks (Guyomarc’h et al 1998). The proportion of breeding birds in northern Europe that have been hatched earlier in the same season may be around 50% (Migration Atlas). The first arrival in the county is usually in the second half of May, but new calling birds seem to turn up on any date until early August. Often the new arrivals seem to occur in waves, probably comprising adults and their offspring pushing north for a further breeding attempt. With favourable south-easterly winds, higher numbers reach Britain in some ‘Quail years’, of which the most recent was in 1989 when 1655 pairs were estimated possibly breeding, with 50 of them in Cheshire and Wirral. This total seems impressive to us but is only a tiny fraction of the European population of around 3 million pairs: Quail is a southern species, here at the fringe of its range. Quails are erratic in their occurrence: they were found in 24 tetrads in our First Atlas and 16 in this Atlas, but only one of the tetrads was the same.